Important information: this fullday sightseeing tour can also be arranged starting from Lienz, Bolzano, Merano, Trento, Verona and surroundings. Contact us if you have any questions! Starting in Innsbruck, we follow the upper Inn valley to the Resia mountain pass, where we cross the border into Italy. 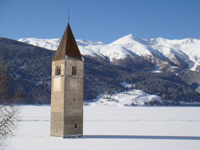 We will enjoy splendid panoramic views of the Austrian, Italian and Swiss Alps and have a short photo stop at the Resia lake with its famous submerged campanile from the 14th century. Before lunch, we will reach the city of Merano where we will follow a guided city walk with a professional English speaking tourguide. In the afternoon, our sightseeing tour takes us to Bolzano and we will visit the Archeological museum with the famous mummy of "Ötzi the iceman". Via the cities of Bressanone and Vipiteno, we will return to Austria via the Brenner mountain pass and end our tour in Innsbruck. Depending on how much time you have at your disposal for a sightseeing tour to Alto Adige (South Tyrol), the itinerary of the guided panorama tours proposed by Innsbruck Tours can be modified to include guided tours of Bressanone or Vipiteno and / or a visit to the medieval monastery of Neustift.